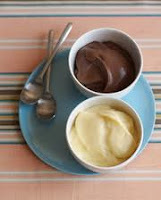 Make your own Vanilla and Chocolate Pudding Mixes for pennies. The best part is you'll learn how to use some of your food storage items more frequently, and your family will enjoy the tasty benefits! Stir the ingredients together until well mixed. Store in a tightly covered ccontainer in a cool place. Makes enough for 24 servings. Chocolate Pudding Mix: add 3/4 cup cocoa and 1/4 cup more sugar to above ingredients before stirring. Combine mix with water in top of double boiler. Place over boiling water and cook until thickened, stirring constantly. Cover and cook 5 minutes longer. Add the butter. Remove from heat and beat half of the hot mixture into the egg. Blend slowly into the remaining hot mixture. cover and place in double boiler over hot water for 1 minute. Stir in vanilla and chill. Serves 6.